Production and upgrading processes in emerging economies are studied by geographers and economists since many years. However, the relevance of institutions, in particular the informal ones, has not yet been fully understood. The institutional perspective of this e-book is relevant because regional production and innovation are embedded within multi-layered institutional settings which are enforced by actors at different spatial scales, e.g. local stakeholders, national policy makers, and multinational firms. 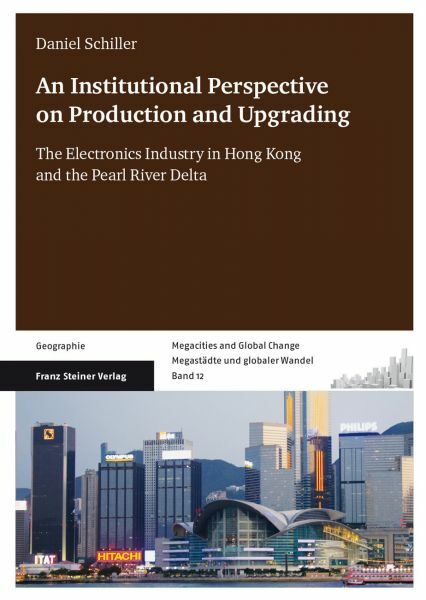 This e-book analyses the electronics industry of the mega-urban region of Hong Kong and the Pearl River Delta which is the world's most important production cluster of the industry. A conceptual discussion on the institutional approach to informality and an overview of methods to measure it set the scene for five empirical chapters. The description of the spatial and organisational transition of the electronics industry in the region is followed by a thorough analysis of the role of personal relations for doing business. Finally, the most important issue for the long-term competitiveness of the region is discussed: upgrading and innovation. PD Dr. Daniel Schiller studied geography majoring in economic geography at Leibniz University Hannover and Vienna University of Economics and Business. He was a research associate at the Institute of Economic and Cultural Geography at Leibniz University Hannover from 2003 to 2012. He completed his PhD thesis on university-industry linkages in Thailand in 2005. In 2012, he received his professorial qualifications (Habilitation) for his work on the electronics industry in Hong Kong and the Pearl River Delta. His focus of research is on regional innovation, science and higher education systems, globalization, developing and emerging countries, and public finance. His regional research is mainly about Germany, the European Union and its neighboring countries as well as East- and South East Asia. Since 2012, he is a senior researcher at the Lower Saxony Institute for Economic Research (NIW) and is responsible for the research field 'Regions and Institutions'.